This past Saturday was Nuit Blanche here in Winnipeg. Some 30,000 people went around the city checking out various exhibits of art and culture. One of the exhibits at the art gallery was ARTcadia. A bunch of displays setup with indie games and hacks. I had the NES-chuck out again and it saw a lot of use. Click here for some more pictures from the WAG. While similar to Re:Play, the core difference for this event was that the games were setup as displays rather than booths. Because of this, there wasn’t someone around to provide instructions on how to start the game (ie. how to access the start and select buttons). We had a sign up with some instructions, but few people showed any interest in reading the signs. I may have to re-evaluate how this thing works for any future public displays. CBC was running a contest called “Culture Vulture” where you have to go to cultural events and text in the posted word for an entry. SkullSpace must be getting some attention because the keyword posted at the WAG was “hacker”. NES-chuck Demo from Benjamin Bergman on Vimeo. I finally got around to making a quick demonstration of my NES-chuck. Code for the NES-chuck can be found here. The future event I mention is ArtCadia, which is part of Nuit Blanche. I’m not yet sure if I (or the NES-chuck) can attend, but I will keep this updated. After the break, there is a rough draft of my script for the video. Last weekend was SkullSpace hackathon 6 and it was a great time. This hackathon was a less structured hackathon than we have had in the past and so myself and another fellow hacker decided ta get a full hack in, start to finish. The idea we had was to turn a Wii nun-chuck into a controller for the classic NES gaming system, thus dubbed the NES-chuck. While largely intended to be for our own amusement, the nun-chuck as NES controller does allow for one handed play meaning it could be a useful controller for people with disabilities (or for those who want to play two player co-op games by themselves). By the end of the hackathon I had a working prototype system. It has a few timing related bugs that should be pretty easy to iron out. My intention is to make a much cleaner version to display at the Winnipeg Art Gallery on June 11 as part of the Re:Play event, an exhibit focused on gaming art and culture. I will try to post some pics and videos of the prototype and final versions shortly (the current, rough code can be found here). In the meantime, you should check out Re:Play here (scroll down on that page), here, and here. 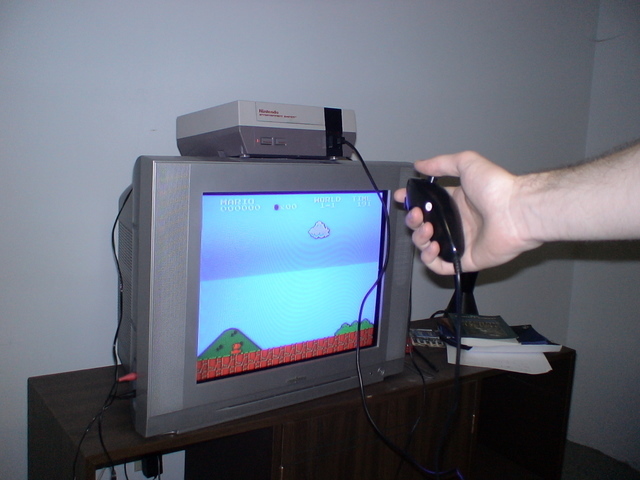 If you come down, you will be able to try the NES-chuck first hand (no pun intended)! UPDATE: I was up late working on this thing and thought I’d share a quick picture I snapped of it. I still have some kinks to work out. The nun-chuck is a knock off from deal extreme and is a bit peculiar. I am likely talking to it wrong, but right now the z button inverts the response of the c button. Also, the accelerometer data is not very stable. None of these things were a problem with an authentic nun-chuck, so I’m sure I just need to change the config a bit. At the end of last year, Microsoft launched the Kinect, a motion tracking add-on for the Xbox 360 gaming platform. Adafruit Industries, an open source hobbyist hardware company, announced that they would be offering a bounty to whomever first released an open source driver for the Kinect. The bounty started at $1000, but each time Microsoft complained about it, they raised the bounty. After only a week, the bounty had increased to $3000 and was awarded to a man in Spain. Within a few weeks of that, and having seen all of the interesting things that people were doing with the Kinect (and the large volume of sales they were receiving because of it), Microsoft changed their story, saying that they had originally left the Kinect open for such 3rd party projects. I followed the story pretty much from the beginning and it was pretty interesting to see how things progressed. However, a few days ago Johnny Lee, a former developer of the Kinect and author of the Procrastineering blog, announced that he had been pushing for Microsoft to release Kinect drivers, but that they were unwilling. As a result, he had sponsored Adafruit to organize the Open Kinect challenge. While it probably would have been in Microsoft’s best interests to release the driver themselves, keeping Kinect development largely done on their platform, the Open Kinect challenge made a cross platform driver available which ends up benefiting everyone. 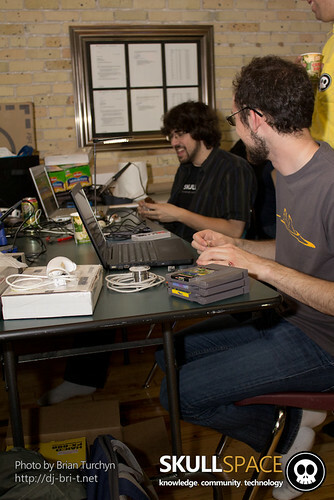 Yesterday I had the honour of attending a hackathon with Winnipeg’s new hackerspace, SkullSpace. I brought my CAN bus boards to do some soldering and also did some lock picking. You can read more about the event on their blog. They are in the process of getting permanent space together, so we met at the Red River College campus (it is a sweet set of buildings and you should check it out if you can). Once they have the legalities and funding (via donations and paid memberships) then they will start equipping a space. I’m really looking forward to it!